OK, we all dream of fortune, but will we find it on this 2 By 2 offering Dreams of Fortune? There is the usual 5-reel, 3-row format with 30 paylines - most of the time! (as will be explained). There are stacked Wilds on all reels with the game Dreams Of Fortune logo on. 5 of-a-kind of these pays a not inconsiderable 83x stake. The dreaming shepherd then pays 17x stake right down to the J,Q,K at 1x stake. Some symbols are stacked double too. The sound effects are soothing rather than aggressive and as you play the alarm clock in the top left of the screen may vibrate and drop on the dozing shepherd's head - he will wake up and dispense one or more extra Wilds onto the screen after any spin. Always good for a a slot to incorporate an in-play random feature, but what do we get for the scatters? 3 scatters anywhere triggers a screen whereby the dozy shepherd will daydream into one of two clouds. Luckily there are no 'pick-me' options here, but both clouds have enhanced free spins! Again, this is a positive as there is nothing worse than waiting for scatters on a game that picks your feature 'randomly' from several features, mostly rubbish while you are willing the good one to appear. These are both good. In the first our narcoleptic shepherd has a toss and turn. You are awarded 7 free games which can't be retriggered, but with this Toss And Turn bonus - not only does the dreaming shepherd become Wild but he adds 2-4 connected Wilds after each spin AND the game (like the Terminator 2 bonus) grows to 4 rows from 3 and has 40 paylines instead of 30. If an errant sheep drops on the alarm clock you are awarded 5 extra spins. Good potential here. 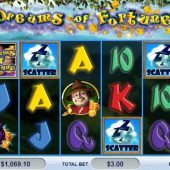 The second free spins round is called the Wild Dream Bonus and 10 spins are awarded - this time the slot becomes 243-way AND you are guaranteed a random reel Wild each spin when the spinning shepherd (finally awake!) lands on that reel. You can also get 5 extra free games when the sheep drops on the clock as above.